The emergence of a new power trio, progressive to say the least, is always heartwarming; Canadian, even better and from colder parts of the planet, seems to inspire wondrous songs. (Can anyone say ‘Rush’?). Calgary can be no different. Andrew Balboa – Vocals, Keyboards and Rhythm Guitars, Omar Sultan – Guitars, Bayan Sharafi – Drums erupt onto the scene with a new trio of songs that will enrapt and ensure their place in prog rock/metaldom. Face of Void, a chilling, atmospheric piece that stars with a mixed blend of haunting and complex vox and powerful guitars – chug chugga stuff yea! Strong gravocals in there for the death metal people, intricately placed and sung. A beautiful arrangement from a very Rush sounding to a Yes sounding to a Marillion sounding to a Styx sounding to ultimately a Mirror sounding bit at about 3:15! Great! Time Manager starts as a beautiful speed metal ditty and continues as a metal banger sure to get me another complaint from the neighbors – stellar playing, hammering and strumming and vox! “I…WANT…!” at 1:12 kicker! Screaming death metal vocals mezzoing into near operatic overtones is spectacular. The dual axe attack at 3:33 is superb. Slowing this down at 5:35 of this 9:13 song is revealing of their prog rock admiration. 10/10 just this song alone. Finally rounding out this triplet of tempo, is the 11:53 Chronovisor, an intricate, keyboard heavy piece that needs to be heard on headphones. I normally don’t use them, but this is so instrumentally superior, I feel I am missing the experience and bits of music that escape into the ether. Beautifully blended, this is one of the best songs I have heard all year. Love the work at 3:00 onwards. Hair rising! An outstanding record, looking forward to further Loss of Contact with Reality! 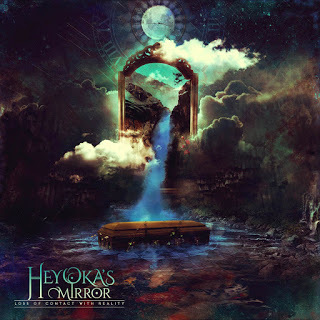 Read our interview with Heyoka’s Mirror here!